Day two of Channel 5's Thomas Week, as well as my bumper eleven day marathon to review every episode released this week (including the ones from Start Your Engines!). Anyway, here are my thoughts on Very Important Sheep! Over the past few years, Brenner, McCue and co. have taken concepts that didn't work before and tried to make them better. The Thomas Way improved on the basic concept of Up, Up and Away!, Too Many Fire Engines vastly improved upon Race to the Rescue's conflict and they tried hard to improve Charlie. But there was one concept that I thought they'd never get right: the one from Wonky Whistle and Muddy Matters. Enter Helen Farrall, who produced this absolute gem. Everything about the story makes absolute sense; no one is made to look completely incompetent and the animals are well looked after by all the people they come in contact with. I also really like that the whole thing took place on a genuine representation of the Ffarquhar branch line. Hopefully this is another step (like Toad & the Whale taking place on the Little Western) to give the engines their own distinguished roles on their own routes. Granted, Thomas may still be shoehorned into scenarios he shouldn't really have any business with, but at least we have a starting point. Annie's characterisation really interested me. She's never really been shown to be anything other than Thomas' guardian, but here she's shown to care a lot about her own appearance which I quite like... as long as they don't make her really snobby in the future..! It provided some good comedy and a great opportunity to see how well she and Clarabel interacted with each other. 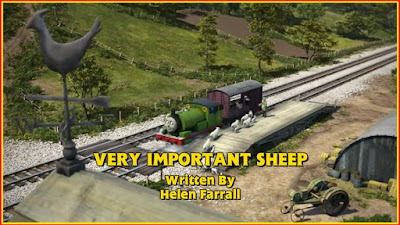 I think the only real issue I have with it is that it can get a bit dull and repetitive, but to Helen's credit, at least Percy's stoppages were all unique. Thomas' though? That's where things get predictable as you know where he'll stop, and you know he'll only be cleaning up Percy's mess. #S19VIS --Wonky Whistle and Muddy Matters done right. Which I thought weren't actually fixable. #S19VIS Annie and Clarabel are enjoyable, but overall, it's a dull episode that feels like it's been stretched out from two minutes to nine. Suppose I best watch today's episode. As if I haven't got enough to do! Finding sutible premises for offices is no easy take, you know! There I am. We're off to a good start! I should do stand-up really! Have you heard the one about the nun with very loose morals? No, I haven't either but I bet it's funny! No wonder the Royal Mail is in such a state with Percy being involved! A recipe for disaster and no mistake! Since when do guards where workmen's outfits I hear you ask? When I can't be bothered to buy more guard uniforms, is the answer. Piglet on the line! I wonder where Pooh is? See, I told you I should do stand-up. Fancy stopping for a bloody lamb! I'm not running a petting zoo. Watch out Thomas! I think Annie's getting broody! As the old saying goes: If you want a job doing properly, don't give it to Percy to do. That episode was absolute rubbish. I now have a craving for lamb chops, so if you'll excuse me, I'm off to the farm. Bye bye! Helen Farrall is fast becoming my favourite writer currently working on the show, and it really says a lot when I think that this, despite being excellent, is my least favourite effort from her. Despite it being a bit dull in areas, the story is still really strong with good pacing, understandable actions and a piglet that is absolutely hilarious yet adorable. Oh yeah, and I think a certain traction engine showed up somewhere..?